To anyone with an Open Water card, reasonable buoyancy control skills, and so much as a hint of curiosity, I highly recommend trying a cavern dive in one of the cenotes surrounding Tulum, Mexico. We dove four different caverns the third week in June. For $60 U.S., the CEDAM (Mike Madden) Dive Center in Puerto Aventuras provided the standard rental equipment, transportation, and a well-equipped cave guide to one of several caverns in the area. A quick perusal of the 'Net will reveal other dive providers in the region, and there are at least two huge, distinct cave systems from which to choose (Nohoch Na Chich and El Jacinto Pat). Each dive began with a review of the differences between open water and cavern diving, and a set of rules to be obeyed absolutely. The safety margins get a little wider in the caverns; 1000 psi in, 1000 psi out, and 1000 psi in reserve was a standard. One moves much more deliberately in the caverns, as a false move or aggressive kick can stir up a disorienting cloud of talcum-fine silt, or break a formation millennia in the making. No snorkels or leg-strapped dive knives are allowed, nor anything which might snag in the safety line. Lights and backup lights were standard issue. The guide wore double tanks and carried cave and gap reels. Each was an incredible experience, well worth ten times the price, and each was dramatically different from any of the others. The caverns were pristine, albeit amply marked with safety line. The approaches to the cenotes (surface pools, doorways to the cave system below) varied from "gear up and walk in" to "gear up and walk 250 meters in the blazing sun through a steaming fog of mosquitos, then fall ten feet into the most inviting water you've ever laid eyes on." The water temperature varied from 77 degrees Fahrenheit in the fresh water to 83 degrees in the salt, a welcome change from the oppressive June Yucatan climate. Once in the water, I was struck first by the incredible visibility. The water outside the immediate cenote zone is unbelievably, almost disorientingly clear. In every cavern, fresh and salt water separated along a clearly demarked plane, forming a "halocline" and producing startling optical illusions. 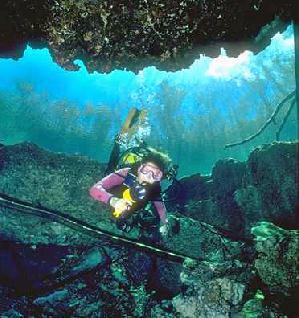 From above, the halocline might reflect the beams from the dive lights, appearing as a mirror; from below, at times it appeared as an infinite glossy black ceiling. I noticed a significant change in buoyancy between the two layers -- the guides suggested that we weight up as if for fresh water, but I felt a bit too buoyant in the salt toward the end of each dive. 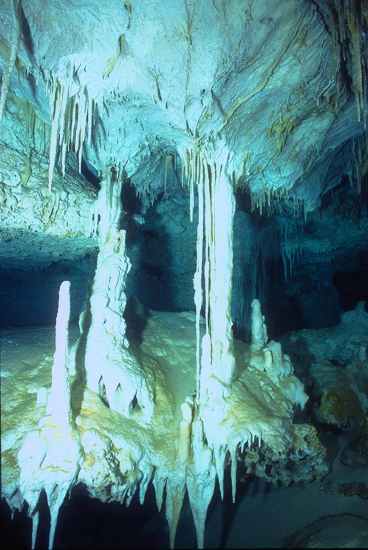 The other amazing feature of each cavern was the difference between formations. Three had obviously formed above water, and had generous stalactites, stalacmites, and pillars; the fourth had great sheets and plates of opaque crystals suggesting dinosaur fossils and ancient skeletons, and appeared (improbably) to have had a significant underwater evolution. 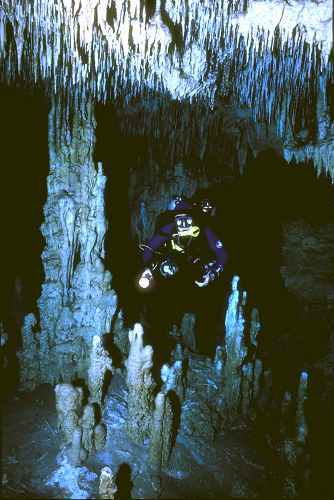 The guides told us that every cenote, cavern and cave in the are has its own distinct features and splendors, making the potential variety between dives almost unthinkably large. Some of the caverns suggested cathedrals, with huge vaults and brilliant, mesmerizing pillars of light; others were more intimate, with myriad small passages beckoning. Some seemed undisturbed for eons; others looked as though some tremendous violence had occurred in the recent past. While each had their unique set of creatures swimming about, the fauna was neither copious nor, to my untrained eye, compellingly demanding of study -- I encountered nothing large, intimidating, or threatening. The greatest danger I perceived in the caverns, in fact, was a strong sense that "just a little further would be perfectly safe." Cavern diving is not cave diving, nor will the guides tempt you into becoming (or permit you accidentally to become) a cave diver. This being my first experience with overhead environments, I must say that I'm completely, utterly hooked, and will be pursuing cave diver certification. The simplicity, freedom from specialized equipment and total enchantment of the guided cavern dives, however, will never fail to appeal. Those reading this who have never tried it should really do so (pick your own operator/guide - I'm not making any specific endorsement). Those who have tried it already know just how great an experience it is; that's why they're on the Caving page! The Cenotes of the Riviera Maya by Steve Gerrard is a must for all cave fans. Over 200 photographs and descriptions of spectacular underwater Mexican caves.